Microsoft is banking on its digital assistant, Cortana, to help Windows 10 and the Edge browser stand out – but Cortana is also ready to show up at work. At the Ignite conference Microsoft demoed Cortana answering questions about how to use Windows 10, finding PowerPoint presentations on specific topics and drilling into the statistics of conference attendees by showing dashboards from the Power BI service. Power BI is a good match for Cortana because it has a model of the data you're interested in that's already set up for asking questions using everyday language. The search field in Power BI is actually a feature called Power BI Q&A that extracts information like project names, customer addresses, dates and other significant fields from your data. This lets you ask questions like 'which projects are due to be finished by July?' or 'which countries are my best customers in?' or 'how many PCs do my customers have by industry?' – which sound very like the questions you can already ask Cortana, just with a knowledge base about your business rather than more general web searches. Power BI also creates visual representations automatically, like tables and maps, and the maps let you zoom in to see more detail. Again, those kinds of small chunks of information fit into the Cortana interface. And Power BI gives you a model for lots of kinds of data – from data you load in from Excel spreadsheets to data it extracts from SharePoint, Microsoft Dynamics, SQL Server or third-party services like Salesforce and Twilio. That would turn Cortana into an assistant for a wide range of business tools, especially as the connection uses the Azure Active Directory single sign on system, so you only get access to the information your account has the rights to see. Using Cortana to drive Power BI was just a demo, Stella Chernyak of the Windows team told TechRadar, but connecting to different applications is a feature that will be included in the business versions of Windows 10. 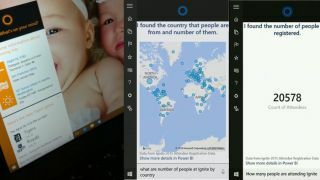 "Cortana has an extensibility framework so other third-party providers can connect to Cortana to let me use natural voice commands to extract business information from their systems," she said. "It's one thing to use Cortana personally and another when you can join Azure Active Directory to get access and it's so relevant to you. I'm meeting a customer; I can ask Cortana 'what is their profile or what did we talk about last time'," she suggested. Plus Cortana can track your business interests and make suggestions the way she already does for your interests and travel plans. "Cortana is proactive," Chernyak pointed out. "Cortana can use the data – with your consent – to do meeting preparation for you, to make intelligent predictions about your line of business and leverage knowledge across employees. Think of getting new employees up to speed being as proactive as Cortana suggesting things."